I spent the last hour of a good night's sleep dreaming about some minor injustice that involved $15, but I don't remember the details. In any case, I woke up refreshed, but perturbed that I was out $15. It was too late to roll over and relitigate in my dreams, so I got up. After doing some stuff around the house, I went out to take a walk in the park while Malida went to her Pilates class. It was a cool morning, and I wore a sweatshirt for the first time. On the way home, I stopped and got some soup at the local Vietnamese cafe. 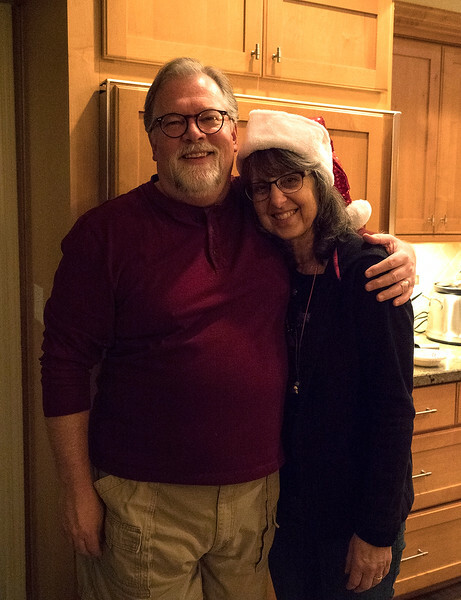 We had plans to go to a faculty Christmas party in the afternoon, put on by my awesome boss and her husband Dave. It's the first faculty social event that I have seen in my four years there. I think they used to do it a lot, but the atmosphere changed. Now it's changed back. Carel and David. They are both awesome people, and threw a great party. I decided to make something I saw on Facebook the other day to take to the gathering. There are a couple of things I love about Facebook. One is the whole birthday thing, where everyone you have ever known wishes you a happy birthday. The other is all the cool recipes that people post. 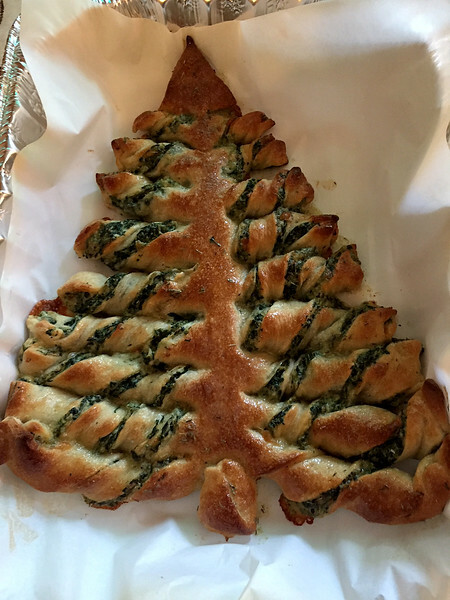 This recipe was a pastry Christmas tree stuffed with spinach, cheese and herbs. It was one of those recipes where it looks amazing in the pictures, but you imagine it looking much less than that in reality. I don't usually plan to make things for the first time ever when I am sharing them with others, but I thought I would give this a shot. It turned out great. Looked good, tasted good. It was gone in a flash, which is really the only thing that counts. Malida wants me to make it again and bring it in to her work next week. I took my camera for some more practice. It did ok outside where there was light, but not as good in the house where it was somewhat dark, which I expected. It came with a simple attachable flash, and I will try that next time. 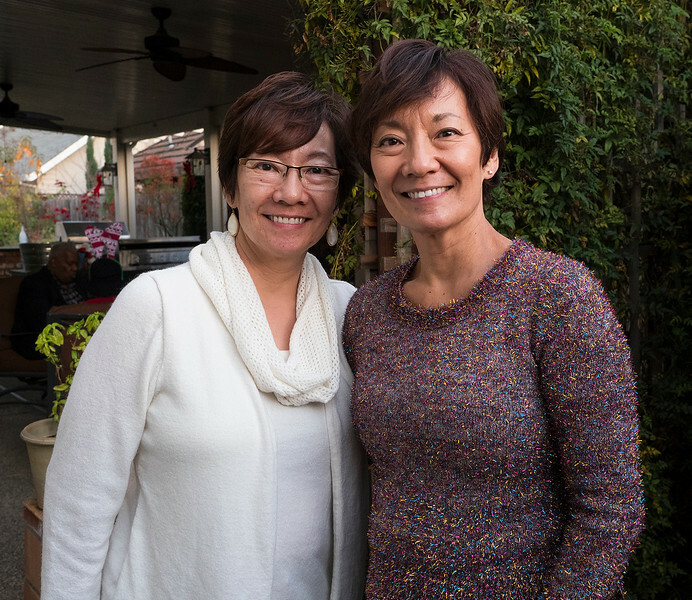 One of the more surreal moments was when I first walked into the house and saw my colleague Jennifer standing in the kitchen, and a moment later saw her walk into the kitchen from another room and stand next to herself. It was her twin sister, who I knew existed, but I'd never seen them together. They look so much alike, and sound alike. They are both nursing school teachers! Her sister lives in Southern California and is up for a visit. Standing together, I can tell them apart, but if I encountered them apart, I'm not so sure. It was a really nice gathering, and I am glad we went. A camera in my hand is the best cure for social anxiety.